Refreshing a diagram’s thumbnail image forces the thumbnail to be re-generated to reflect the latest changes in the diagram. In 'Diagrams View,' you have the option to refresh an individual diagram image, or you can refresh all images simultaneously. To refresh an individual diagram image in 'Diagrams View,' click the ' ' icon located at the bottom right of the diagram you wish to refresh. Click the 'Refresh Image' button to generate a new thumbnail image. 'Diagrams View' will refresh to show the updated image. To refresh all of the existing diagram images simultaneously in 'Diagrams View,' click the ' 'located at the top right of the view. 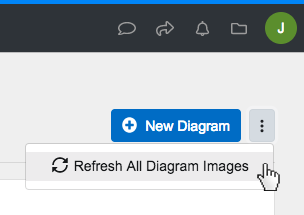 Click the 'Refresh All Diagram Images' button to generate new, updated thumbnail images for all of your existing diagrams. 'Diagrams View' will refresh to show the updated images. Refreshing a diagram’s thumbnail image forces the thumbnail to be re-generated to reflect the latest changes in the diagram. In ‘Diagrams View,’ you have the option to refresh an individual diagram image, or you can refresh all images simultaneously. To refresh an individual diagram image in ‘Diagrams View,’ click the ‘ ‘ icon located at the bottom right of the diagram you wish to refresh. Click the ‘Refresh Image’ button to generate a new thumbnail image. ‘Diagrams View’ will refresh to show the updated image. To refresh all of the existing diagram images simultaneously in ‘Diagrams View,’ click the ‘ ‘located at the top right of the view. 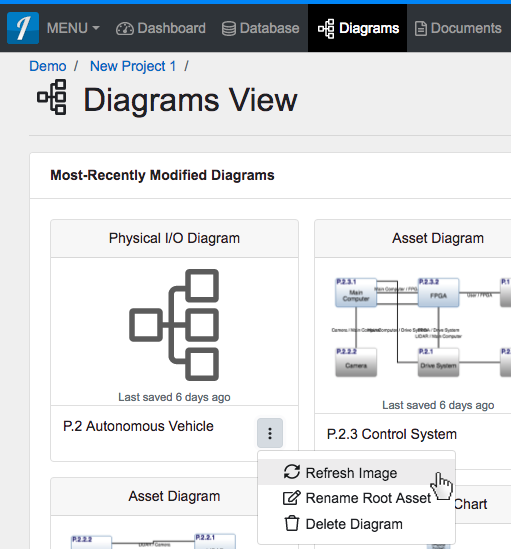 Click the ‘Refresh All Diagram Images’ button to generate new, updated thumbnail images for all of your existing diagrams. ‘Diagrams View’ will refresh to show the updated images.